In COMMITTEE members and volunteers of the Version 1 Leinster Loop cycle recently presented a cheque for €15,500 to the National Breast Cancer Research Institute, the proceeds of last year’s event. 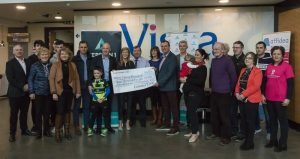 Kindly hosted by great supporters of the annual cycle Ger, Annette, PJ and Stephen Roche at the Vista Primary Care facility in Naas, the presentation was also attended by Jarlath Dooley and Emer Fogarty of Version 1, the event’s headline sponsor. Other sponsors present were Ray Whelan of Ray Whelan Waste Management, Carlow and representatives of Civmec Plc. In accepting the cheque, Paul Earley from the research institute thanked the Leinster Loop for its tremendous work for breast cancer research over the years, which has now raised €98,000 for the institute. The Version 1 Leinster Loop is an entirely voluntary undertaking and its nine stagings to date have raised more than €304,000 for breast cancer research and for St Laurence’s Community Complex, Narraghmore. The event has been nominated as Cycling Ireland’s best leisure cycling event on five occasions and attracts participants from all over Ireland and overseas. The 2019 Version 1 Leinster Loop will take place on Sunday 30 June and includes routes of 145km, 100km and 55km. On the previous evening, the ever-popular family fun 12km and a 25km local history cycles will take place. Entry to the Sunday cycles is by online registration only and entries are capped, so register now to avoid disappointment. Full details and entry can be found on www.leinsterloop.com and on social media.